Beskrivning In a town where anything goes, you can’t rise to the top without tearing a few others down. From dodgy deals to shifty tricks, do what you gotta’ do to go from small-time slumlord to filthy rich tycoon. Build your wealth. Build your power. 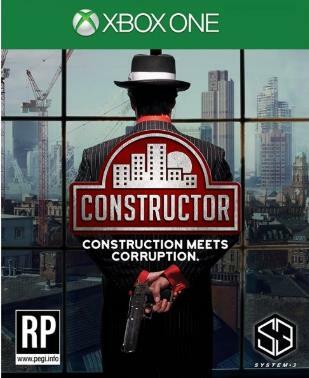 Build your legacy with Constructor. You take on the role of a budding property tycoon who must do battle with your competitors to create a thriving and profitable city...in ANY way you see fit! This includes not only the speedy building of houses and factories, but also having to cope with the incessant demands of your tenants as well as keeping a whole bunch of UNDESIRABLE characters under control! This ‘colourful’ group of degenerates can, however, also be used against the competition with humorous and catastrophic effect! The use of these undesirable elements is one of the core game mechanics. Whether you’re terrorizing the neighbourhood with Thugs, sending a group of Hippies to picket enemy factories, letting Mr Fixit “repair” the enemies’ gas and electrics fittings, or whether you take the big decision to involve The Mob in your business, there are countless ways to help your fellow competitors fail in a spectacular fashion!